In the quest for a dessert that was keto friendly enough to fit my macros while also being convincing enough to share with non-ketoers over the holidays, cheesecake seemed like an obvious option. 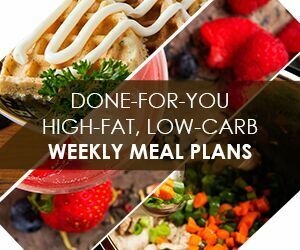 Cream cheese and eggs, the main ingredients of most cheesecake fillings, are low carb as is, and swapping out the sugar for a keto friendly option like Lakanto or Swerve is pretty straightforward. With Thanksgiving just around the corner, I wanted to go for something seasonal, so fall flavors seemed like a good choice. 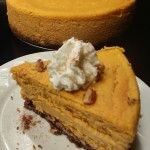 And thus this keto pumpkin spice cheesecake was born! I have to be honest, pulling this cheesecake out of the oven was probably one of my proudest moments of keto baking (even though the top cracked just a little…). The orange color is perfect for the season, the taste gives no hint that this is a “diet” dessert, and holiday or not, 3 net carbs is pretty easy to squeeze into my macros. Preheat oven to 350F. Prepare a 9" springform pan by greasing thoroughly with coconut oil. Using a food processor on medium-high speed, process pecans until they resemble a coarse flour. In a mixing bowl, combine pecan "flour" with remaining dry ingredients. Mix until well combined. Add melted butter to dry ingredients and stir to combine. Press the crust mixture into prepared springform pan. Bake in preheated oven for 12-16 minutes, or until crust is set and lightly browned. Remove crust from oven and allow it to cool while you make the filling. Important: Lower oven temperature to 325F. Using a stand (or hand) mixer on medium speed, beat together cream cheese, Neufchatel, and sweetener. Add pumpkin, vanilla, cinnamon, and pumpkin spice. Mix until well combined. Reduce mixer speed to low and add eggs one at a time, mixing until combined after each addition. Bake in preheated oven for approximately 1 hour and 10 minutes, or until center is just set and edges just begin to brown. Allow to cool at room temperature for about 10 minutes before carefully running a knife around the rim of the pan to loosen. Refrigerate cheesecake for a minimum or 4-6 hours to set before serving. Optionally, serve topped with whipped cream, crushed pecans, and/or cinnamon. As with all cheesecakes, the hardest part of making this is waiting for it to cool. Try to be patient! This keto pumpkin spice cheesecake definitely needs some time to set to reach its full potential. Need to cut back on calories? Use just 2/3 of the crust, or even leave it out entirely! You can also swap out an additional 8oz of cream cheese for Neufchatel (or 1/3C of sour cream, thanks Jane M.!) . 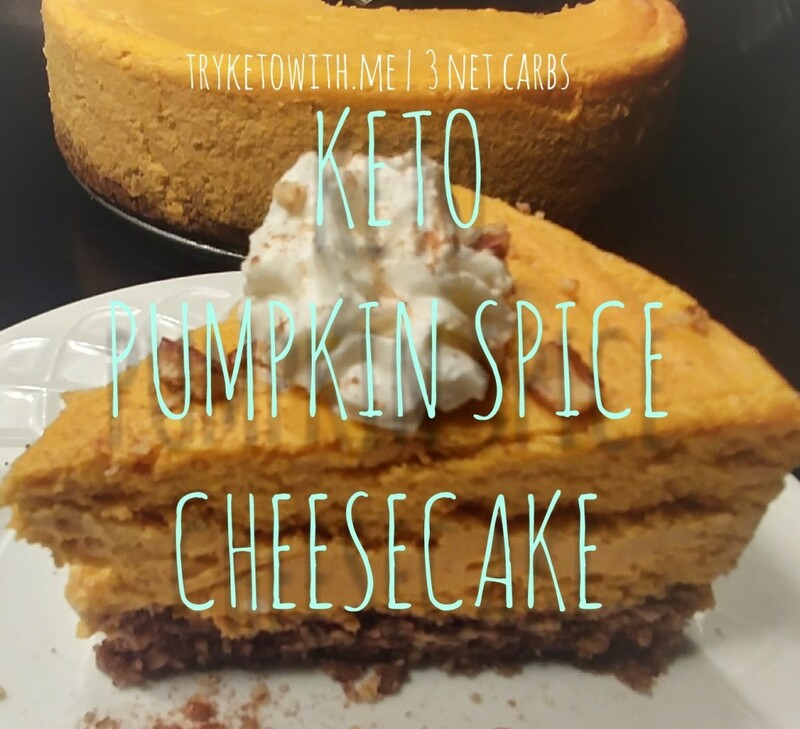 I usually start checking this keto pumpkin cheesecake for doneness around 1 hour in. Try not to open and close the oven too much before that to avoid sinking in the middle. 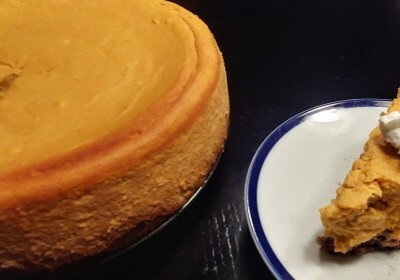 To help prevent your keto pumpkin spice cheesecake from cracking, you can fill a baking dish with water and place it on the shelf beneath your cheesecake while it bakes. The filling doesn’t rise much, so you only need to leave about a half inch or so of space when you fill your pan. If you end up with extra filling, feel free to make yourself a mini cheesecake to enjoy while the big one is baking/chilling! I tried this in a blind leap of faith, since there were no comments or reviews for it. I made it exactly as stated (well, a little less sweetener, since I overestimated the amount of Swerve I had), and it turned out PERFECT. It was a little fluffier than I typically like my cheesecake, but I also beat it pretty well, so…. There was no weird fake sugar aftertaste and it was nicely spiced and delicious. I’m something of a cheesecake expert, but new to keto cheesecakes, and this was a keeper all the way. Also, just as a note for others, I baked it for exactly 1 hour and 10 minutes, and the top was barely brown at all and it was a bit liquidy, but I took it out and it set up perfectly. I’ve got one in the oven. Can’t wait to try it tomorrow am. Cinnamon….. I used 4 blocks of cream cheese.